Playing in the 2017 Little League World Series (LLWS) is a dream that most young baseball players have. What was it like to be a young teenager, taking the field in front of 20,000 fans? It was surprising. It sent a wave of chills and nervousness through my body, and also, a feeling of excitement. Who wouldn’t love to play in front of rows after rows of people cheering you on? What was it like knowing you are squaring off against the best players in the world? By far, this was my favorite part. It wasn’t just meeting the other kids that made the LLWS so great, it was the competition. I have been playing ball for many years now. My dad is our team coach and I started hitting balls at two years old! So, I was ready for this. When you are out there on the big field or at the plate, what are you seeing and hearing? When I was on the field I did not focus on the thousands of fans screaming and yelling. I was not looking at the packed in crowd holding up signs with our names on them. I was focused, I wanted that hitter to rip the ball to me, so I could make that play, and I wanted that pitcher to throw me a fastball down the can, so I could take a good hack at it to get on base. Can you remember anyone yelling from the bleachers? In my pitching start against Team Mexico I was struggling on the mound at one point. I heard the crowd die down and I heard my mom yelling to me, “You can do this Reid”! I felt a feeling of confidence shoot through my body. I stepped right back onto the mound and continued to do my job and I settled into a good groove after that. Was there one play that you knew was going to work? The very last play of Game 2 against Latin America, Reece Usselman hits a hard grounder on the mound, he makes the stop, turns and fires the ball to me coming across second base. I catch the ball for the force out and throw my hardest to Chase Marshall (aka Big White) at first base. We did it! A double play to win the game against a team many thought we had no chance against. I had a feeling in my heart that this play was going to happen the way it did. But even getting to the World Series is a story. First my team, from White Rock B.C., had to win the Districts and then Provincials. Then we had to go into the nationals in Medicine Hat, Alta., but the thing was if we won the nationals we had to head to the World Series immediately. So we’d be gone from home for over a month. 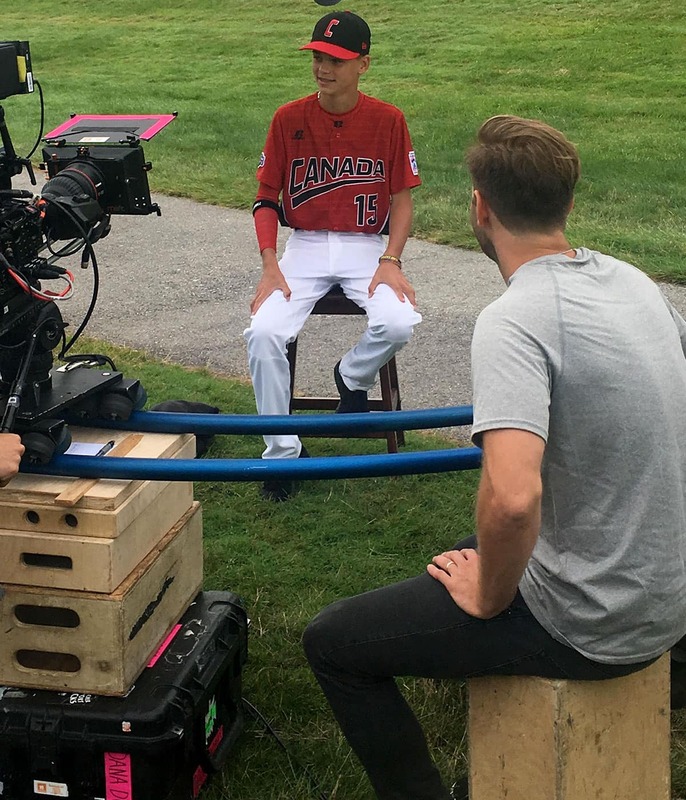 At the nationals, there were CBC cameras set up all around. We also had to do media interviews, which was new for us. The final game against Team Quebec was a nail bitter. We went into it confident but the game did not start out as we planned. Quebec scored the first three runs and played good defence. But we fought hard and chipped away at the lead and eventually took the 12-5 win. I was on the mound in the last inning and two of my best friends since I was eight years old, Ty Fluet and Chase Marshall, made the last out. I will never forget how I felt in that moment. Our team celebrated with our coaches, family and friends as we were presented with the national championship banner! After the big game we had only an hour before we jumped on the bus with 10 large pizzas and headed to Calgary, where we flew to Toronto, then Newark, N.J., then a long bus trip to the LLWS! We arrived in Williamsport, Pa., around midnight. The entire team was checked out by a doctor, and then we had to go quietly to our dorms because all the other teams were already sleeping. The World Series had every activity you could imagine and not imagine on our schedule. All of our meals and activities were on very strict deadlines. The very next morning we had to be up at 7 a.m., to be ready for ESPN, which had us in front of cameras for commercials, player introductions and interviews. After one of the video shoots we did a FaceTime with James Paxton, pitcher for the Seattle Mariners who is from Ladner, B.C. He gave us some advice about playing under pressure and said he will be following our games. After we beat Italy, and then Venezuela, my dad got a video message from former pro and B.C. boy Ryan Dempster, who said he was so proud of us and he was watching all of our games! If I had to pick my top-three memories from the Little League World Series, No. 1 is being the first-ever Canadian team to beat Latin America. Next is watching the Little League MLB Classic — which was the only time a regular season MLB game was played just for little leaguers to watch. And finally I will always remember meeting many players from across the world. Spending two weeks in a dorm with a group of sweaty kids may sound bad but it’s different when you have the bond that my team has. We were lucky also to meet the 1982 Canadian National Team that was all there for a reunion. Two members of that team are not baseball players, but former NHL stars Pierre Turgeon and Stephan Matteau! The Little League World Series was a once in a lifetime experience, and I am grateful for it.